ENGINEERING. PRACTICE. POLICY. 23 February/March 2018 unmanned systems inside needed. The drone will also be equipped with sensors for gases such as sulfur dioxide, meth- ane, hydrogen sulfide and carbon dioxide, a nephelometer to scan volcanic particle size and distribution in the plumes, and atmospheric probes to analyze pressure, temperature, hu- midity, and three-dimensional wind patterns. "Getting a lot of different sensors down to a size where you can put them on a small UAS is not a trivial task," Elston said. 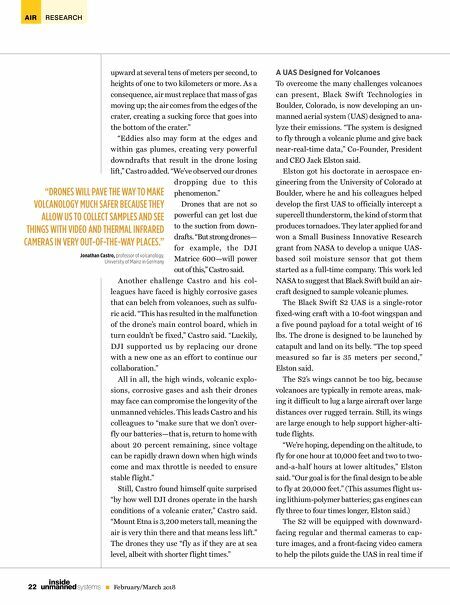 The UAS can, in principle, go places that are too dangerous for manned aircraft or someone on the ground and get data on how a plume varies at different altitudes—as op- posed to satellite observations, which might just capture an average value over its entire column, Elston said. "The idea is to deploy the system as close as one is able to get to the vol- cano and sample its plumes horizontally and vertically, say by f lying to a certain altitude and then spiraling down," he said. The researchers designed the control sys- tems for the S2 from the ground up, including hardware, firmware, control algorithms and user interface, Elston said. Mission monitor- ing is all accomplished via a handheld Android tablet computer. "We're adding in a fair amount of autonomy— with the user interface, you can just indicate an area where you'd like to perform sampling, and it will automatically generate a flight plan to do that, with fully autonomous take off and land- ing," he said. "The human is in the loop just for the safety of the mission or to redirect the sys- tem based on data the researchers see. We'd like to continue to improve the autonomy by adding better reactive ability, such as sensing the ter- rain and obstacles and avoiding them." 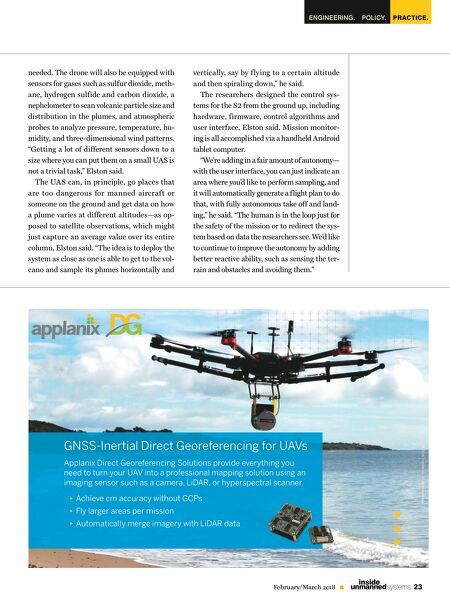 GNSS-Inertial Direct Georeferencing for UAVs Applanix Direct Georeferencing Solutions provide everything you need to turn your UAV into a professional mapping solution using an imaging sensor such as a camera, LiDAR, or hyperspectral scanner. ► Achieve cm accuracy without GCPs ► Fly larger areas per mission ► Automatically merge imagery with LiDAR data © 2018, Trimble Inc. All rights reserved..